Tell Heckmaster has always known the day would come when his demon blood overruled his human emotions. Years of searching for a miracle to overcome the name curse placed on him as a child have been fruitless. Now, after Berner has finally found peace, his worst fears are coming to light—he begins to manifest strange new powers and his finely honed control is slipping. Sylvie Duke has enjoyed the hard-won peace her sister and friends fought for. She has almost everything her heart wants—a successful seamstress shop, a loving family, a devoted suitor, and all the flouncy material she can stand. The one thing she doesn't have is Tell. With his powers growing out of control, his attempts to push her away only make her fight harder to stand beside him. The curious thing is, the closer Sylvie is, the less demon-like Tell becomes. A cryptic warning from an old ally will help her protect their loved ones, but if Tell loses all control, even Sylvie's love might not be enough to save them. This story is the third and last book in The Heckmasters series. I loved it! First off, I absolutely love the new cover! It fits the story wonderfully, although the original cover did too. 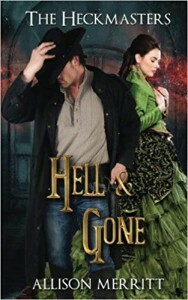 Initially published as Tell, the author received her rights back from the publisher when it closed, and she had a new cover made and re-published it herself with a new title: Hell & Gone. I have noticed this series is no longer available in Kindle format, so not sure if this book is going through another round of edits to be re-published in the near future through another publisher. Tell Heckmaster is a wonderful character. I liked this taciturn man when I first met him in the first book, Hell & A Hard Place. Tell is one of three half-demon brothers who police the portal to Hell in the small town of Berner. Unfortunately, his real name was cursed long ago, and if anyone said it, all Hell would break loose. Literally. Fearing his demon-side, he finds that the only thing that holds it at bay is Sylvie Duke, who also happens to be his sister-in-law. Sylvie Duke is another wonderful character. She is just as stubborn and determined as she was when I first met her. No longer a pre-teen, she has always had her sights on Tell, though the idiotic male seems oblivious to the signs. While Tell struggles with his darker nature, Sylvie finds herself drawn even closer to him. This series is a fantastic supernatural/paranormal romance! The book, set in the late 1800s/early 1900s, quickly swept me up and carried me away. The story is shown through the eyes of both Tell and Sylvie; this made it very interesting. There is excitement, danger, mystery and suspense mixed in with the hot romance. The story continues several years after the events that saw the end to the portal. The town of Berner has now grown, populated with humans as well as the demons' that originally lived there. I loved meeting all of the characters again: Wystan and Rhia, Eban and Beryl, amongst others. The siblings' father, Seneca, and an imp called Dochi are included as introduced characters and add to the cast. Seneca is now the ruler of the Gray Lands, a world created by the god El, and Dochi is one of his subjects. The story is full of twists and turns. The mystery of how Tell's real name became cursed becomes revealed, and what it is. I could tell you what it is, but then it would ruin the surprise, so will not do it - I try not to add spoilers to my reviews. There are also several emotional moments which drew tears to my eyes. Dochi, however, had me grinning. His eagerness in serving the youngest Heckmaster reminded me a little of Dobby from Harry Potter, though he does not look like him. He is extremely loyal to the Heckmasters, and his obsequiousness annoys Tell significantly; this gave the story a little light relief from the danger that threatens. The end of the book left me with mixed feelings. I love how the story took me on a fantastic adventure, but it also made me feel sad that this series has now come to an end. I will miss these three couples, as they have become my friends. 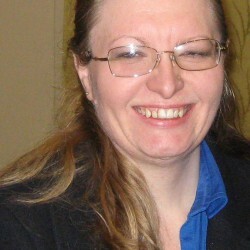 Allison Merritt has written an exciting paranormal/supernatural romance. Her characters come alive on the page, and her descriptions of the scenes made me see them in my mind's eye with ease. I love her writing style, which is fast paced and exciting. I also love the flow of the story; the scenes flowed seamlessly from one to another. This author has found another fan! I would love to read more of her books in the future.